I was born in Northern Ireland, and lived with my family in a little (as in: blink or you’ll miss it) village called Altnamackin in County Armagh until we made the long and alienating journey to New Zealand in 1974. My father was born and bred in Belfast. My mother is Scottish. Dad was a Presbyterian Minister (he’s retired now), and every Sunday he would cross the border to preach in a little church in the Republic before crossing back to repeat the sermon for a second, Ulster congregation. The journey was not without peril. This was at the height of the Troubles, and County Armagh was a dangerous place to be. 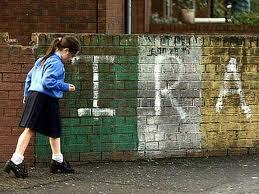 It fact, south Armagh was the most militarised region in Western Europe. 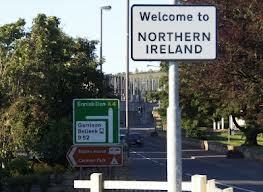 It was a stronghold of support for the IRA, earning it the nickname “Bandit Country”. And yes folks, we lived smack bang in the middle of it. Our house was in the heart of the countryside, surrounded by the verdant rolling hills you see so often on Irish postcards. For some reason the fields behind our house became an informal helicopter landing pad for British soldiers. They visited often. Sometimes they stayed for dinner. There’s even a photo of me in the bath with an armed and camouflaged British paratrooper smiling in the background. I don’t know the exact details – I suspect they have been somewhat muddied by sentimentality and the passing of time – but at some stage the IRA decided they weren’t overly happy about our “colluding” with the enemy. Sandy, our beautiful and stunningly stupid Irish Retriever, disappeared, presumed killed. A brick was thrown though my bedroom window, hitting the exact spot where my cot had sat just 24 hours previously, before some unconscious premonition prompted my mother to move it. 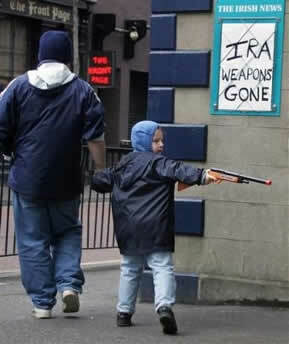 One day someone knocked on the door and informed my father that he was on an IRA hit list. Was it true? We’ll never know. But not long afterwards, Dad accepted an offer from a parish in the small New Zealand town of Katikati, in the alluringly named Bay of Plenty. You couldn’t get further away if you tried. And thus my parents uprooted their lives, left everything and everyone they knew, and flew us all to the fearful safety of a new life. That was 39 years ago. I have a New Zealand passport as well as a British one. I speak with a Kiwi accent (apart from a subtle roll on my “r’s”, which is accentuated when I’m with my family). But despite the distance of years and the thousands of separating miles, a fundamental part of me will always yearn for, and identify with, all things Irish/Celtic. So how does my Celtic heritage help shape me as a writer? Well obviously, Irish people love to talk. And make music. And laugh. And tell stories. (And get drunk and converse with leprechauns, but that’s a whole other blog.) Those are the things I love doing, and – how do I explain this – it’s not a conscious choice, to do those things. It’s more a genetic compulsion, a natural extension of my heartbeat and my heritage. My mother was a singer (she performed on stage when she was younger) and my father a talented piano player. I am so grateful to have inherited my love of music and my singing voice and acting talent from them. They have both also passed on to me a love of language and books. My father was a rather solitary only child, and as he grew up books were his closest companions. They still are. There’s not a scrap of wall space in his home that isn’t covered in bookcases. He reads everything but is drawn to the esoteric, the strange and the supernatural. He used to cover his books on witchcraft and the occult with brown paper so his parishioners wouldn’t be outraged at his rather un-Christ-like preoccupations. The naked devil worshipping probably gave it away though. Joking. This embracing of the spiritual realm is characteristically Celtic (although not limited to the Celts). 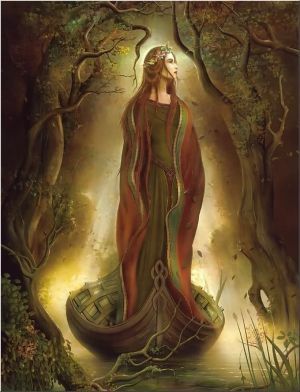 It has its roots in Celtic mythology, with its mythical lands and magical pursuits. I too have a fascination with these things, and there is often a darkness, a flavour of melancholy in my writing. This is not necessarily a reflection of my personality. (I’m great fun at parties. Honest.) But I have noticed that many Irish authors share my predilection for exploring the dark side of the human soul as well as the light. This may be the mandate of all writers, but I think the Irish are naturals. Northern Irish writing also has a brittleness to it, a hard edge, which may be unsurprising given Ulster’s history. I wrote my Masters thesis on Northern Irish poet Ciaran Carson, and in the course of my research I read a great deal of literature concerning The Troubles. The subject matter was bloody and violent, and yet these authors had a way of singing it onto the page with a pragmatic lyricism that was often quite breathtaking – and all the more powerful for its mix of beauty and horror. Ulster people are different from people over the border. They just are. It’s hard to pin down, but they have lived in the shadow of suspicion and fear and the oppression of sectarian violence, and their children have inherited this. It is inescapable, and may be for generations. And the writers, whether they like it or not, are the caretakers and recorders of that psychological history. Maybe the vestiges of it clung to my family’s coat tails as we made our getaway. It’s difficult to say if it influences my writing now. So, throw all this in with my mother’s Scottish Presbyterian work ethic and you get a rather interesting mix. Sure but I’ve gone on long enough. How typically Irish. For those of you who haven’t already, check out an earlier post, “The Belfast Question” (in My Short Stories). I work with a few irishmen (not northen tho), and they do definitely seem to have a bit of a rough edge that you are talking about. I guess you guys have had a bit more of a hard time than us neutral-Swedes?